This beautiful serving or cutting board that measures approximately 10.75" x 8.75," is another conversation piece from Basic Spirit. 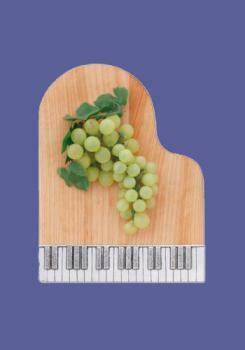 Set your table with this piece and one or two of the other instrument boards and enjoy the musical theme. We even have their napkin rings available. Made of Nova Scotian Yellow Birch with lead free polished pewter trim, they all promise to be "love to use" pieces to they're owner. You may add Basic Spirit's small pate spreader when you add to cart.